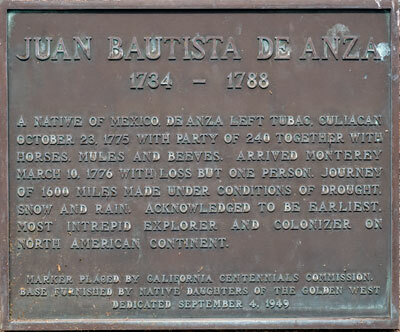 A native of Mexico de Anza left Tubac, Culiagan October 23, 1775 with a party of 240 together with horses, mules and beeves1. Arrived Monterey March 10, 1776 with loss but one person. Journey of 1600 miles made under conditions of drought, snow and rain. Acknowledged to be earliest, most intrepid explorer and colonizer on North American continent. 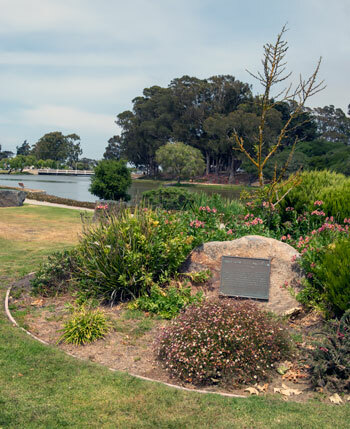 Marker placed by California Centennials Commission. Footenote 1: Almost everything I know, I learned from reading historical markers. Now I know that "beeves" is the plural of beef.